This week, Rogers made a quiet update to its hardware upgrade program for iPhone 4 devices. Previously, Rogers customers who wanted to upgrade to an iPhone 4 normally received promotional pricing of $159/$269 with a voice/data plan. Without a voice/data plan, Rogers customers paid significantly more for the device. This week, Rogers has made the iPhone 4 eligible for the $50 upgrade rebate that customers normally receive with most Rogers device upgrades. Customers who upgrade to the iPhone 4, on a 3-year voice/data plan, will receive a $50 rebate toward the device. 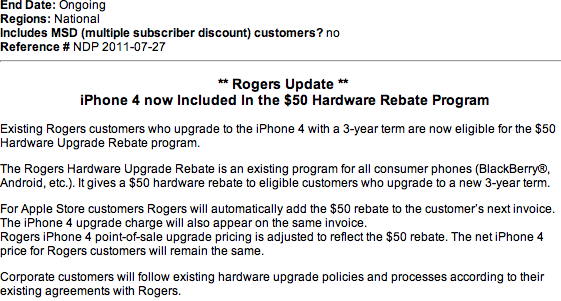 Existing Rogers customers who upgrade to the iPhone 4 with a 3-year term are now eligible for the $50 Hardware Upgrade Rebate program. The Rogers Hardware Upgrade Rebate is an existing program for all consumer phones (BlackBerryÂ®, Android, etc.). It gives a $50 hardware rebate to eligible customers who upgrade to a new 3-year term. Is this the Rogers method to move out old inventory with the iPhone 5 coming up this fall?